The utility industry is in the midst of energy modernization efforts that ramped up in large part following the Northeast Blackout of 2003. The massive blackout, a wake up call to utilities and consumers alike, compounded the concerns about climate change, the burgeoning population and scarcity of natural resources. The blackout spurred the industry to aggressively pursue a more intelligent power grid. At the same time, energy consumers became more concerned about their local power quality and efficiency of the system. Local brownouts are a nuisance and have driven consumers to take greater responsibility for their electricity supply – particularly industries and communities with a critical need for reliable power and energy modernization investments in energy efficiency, renewable generation and power monitoring and control systems increased, often resulting in a diverse and disparate array of installed technologies. 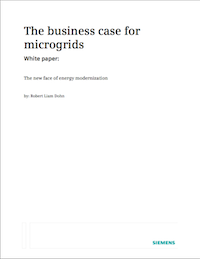 The Siemens vision is to integrate these technologies into automated microgrids that connect seamlessly with the main grid, and may be grid independent when needed. The result is a solution that enhances reliability, efficiency, security, quality and sustainability for energy consumers and producers alike.